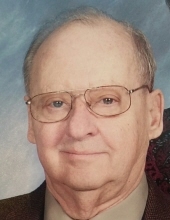 Raymond L Todoroff, age 84, April 8, 2019, of Garden City. Beloved husband of the late Joan. Loving father of Mike (Susan), Kevin (Pam), Janet Ramsden (Monique Wiley) and Sara Gumina. Dear grandfather of Jennifer Gumina and Garrett Ramsden, and great grandfather of Benjamin Ramsden. He was preceded in death by 2 brothers, Roland and John. Visitation Thursday from 2-8pm at the RG & GR Harris Funeral Home, 31551 Ford Rd., Garden City. Funeral Service Friday 11am at the funeral home. To send flowers or a remembrance gift to the family of Raymond L. Todoroff, please visit our Tribute Store. "Email Address" would like to share the life celebration of Raymond L. Todoroff. Click on the "link" to go to share a favorite memory or leave a condolence message for the family.